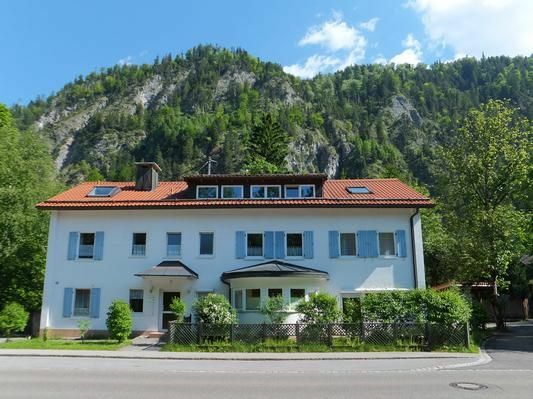 Very spacious and bright 4 * -Apartment for 2-4 persons with 2 rooms and a private carport. You will find a welcoming living room in finca style. Luxury kitchen with microwave, dishwasher, AEG / Siemens appliances. Large, sunny balcony towards the mountain with seating / sun loungers in summer, satellite TV and code free DVD player. It is a Non smoking apartment, suitable for allergy sufferers. Outside the door: rock climbing, hiking, swimming, Nordic walking, jogging, skiing / snowboarding, sledding, rock climbing, wonderful walks through the romantic Allgäu. In the immediate vicinity numerous recreational opportunities for active and families such. As are the Walderlebniszentrum (opposite), the royal castles of Neuschwanstein and Hohenschwangau and several mountain railways, which for hiking and skiing Invite (Breitenbergbahn, Tegelbergbahn, Hahnenkamm / Reutte). Füssen - The romantic soul of Bavaria. Füssens varied landscape between mountains, Allgäu hills and idyllic lakes offer endless possibilities for relaxation and an unforgettable active vacation. The historic old town invites you to stroll and shop, the numerous restaurants in Fussen and its districts Bad Faulenbach, Hopfen am See and Weissensee ensure culinary enjoyment during your vacation. Visit the world-famous royal castles of Neuschwanstein and Hohenschwangau or enjoy a hike to the Tegelberg, Breitenberg or in the nearby Tannheim valley. Füssen has a wide cultural offer with many interesting events, markets and festivals. Visitor's tax / tourist tax: according to consumption (mandatory). Final cleaning: once per object costs in the amount of 75 EUR (obligatory). Bed linen: Included in the price per person per week (mandatory). Towels: per person per week included in the price (compulsory). Bed linen (per person per week, according to consumption 0 EUR). Towels (per person per week, according to consumption 0 EUR).